Autonomous Cars Market Research « Global Market Insights, Inc. The growth of the autonomous cars market can be aptly credited to the exponentially growing automotive sector across the globe. Having sold around 24 million units in 2017, autonomous cars industry has been consolidating its stance significantly in the automotive space, the future of which has been touted to be transformed owing to the rising popularity of connected cars that have lately been revolutionizing the mobility sector. Autonomous cars, which can be operated with minimal or no driving input in any capacity from a human, indeed, are rapidly becoming a reality because of the rising number of research & development (R&D) programs carried out by renowned automobile manufacturers and technology companies. The R&D efforts are mainly fueled by the lucrative opportunities offered by the sector, which has been largely unevolved – in the way the automobiles are operated – since its inception. The intensive R&D efforts by industry leaders along with the support received from regional governments due to the added road-safety feature of the technology, would be responsible for the expansion of the global automotive market. Moreover, the environment-friendly feature of these vehicles would also contribute toward increased sales numbers in coming years. Known as the first generation of autonomous vehicles – level-1 autonomous cars are the ones that incorporate an advanced driving assistance system (ADAS). The system acts as an extension of the driver and helps the vehicle operator operate the car safely. According to a 2018 report by the Victoria Transport Policy Institute (VTPI), many of the level-1 autonomous vehicles incorporate technologies like hazard warning, cruise control, collision avoidance as well as automated parallel parking that take over some of the driver’s responsibilities. The level-1 based autonomous cars market is primarily driven by the rising road-safety concerns around the world as more and more vehicles are added to the roads each year. The increasing road-safety concerns have prompted governments across the world to introduce programs that mandate the incorporation of ADAS inside vehicles to ensure passenger safety. Programs such as the National Highway Traffic Safety Administration (NHTSA) in the U.S and the New Car Assessment Program (NCAP) in the European Union have impelled vehicle manufacturers to deploy vehicles that include a built-in level-1 semi-autonomous system. Amidst this scenario, it comes as no surprise that level-1 autonomous vehicles account for over 90% of the autonomous cars market share. The level-4 autonomous vehicles – currently under the research phase – are expected to be commercially made available in the market by 2022. The rapidly increasing number of research & development efforts by industry leaders in the automated driving domain would be responsible for the growth of level-4 based autonomous cars market in the years to come. According to a 2018 report by Bloomberg, Waymo – an autonomous car initiative by Google’s parent company – Alphabet Inc., is a leading contender that is much ahead of its nearest competitor in the race to deploy an autonomous level-4 vehicle to the market. To bring this accomplishment to fruition, the firm has entered into an agreement with Chrysler to acquire thousands of Chrysler Pacifica minivans that the company intends to modify by retrofitting autonomous driving systems that use LiDAR sensors to drive the cars. However, other industry players are rapidly closing the gap by making significant inroads in this vertical. For instance, automobile manufacturer General Motors Co. has made considerable investments in the sector with the intention of rolling-out a fully-autonomous ride-hailing service that uses a modified version of the company’s Chevrolet Bolt – a car that does not incorporate a steering wheel or control pedals – by the final quarter of 2019. To attain this goal, GM has received a significant investment worth $2.25 billion from the SoftBank Vision Fund. Moreover, companies are also working towards acquiring licenses from concerned authorities to carry out road-tests to test their respective self-driving vehicles. Attributing to such advancements, the autonomous cars market is projected to continue garnering exponential growth in the forthcoming years. 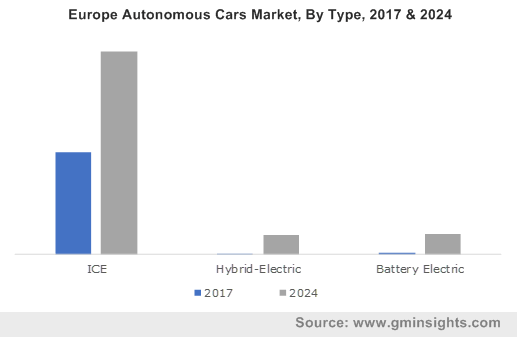 According to a report by Global Market Insights, Inc., driven by the massively growing demand for these vehicles, autonomous cars market size is expected to surpass 60 million units by 2024. This entry was posted in Automotive & Transportation and tagged Autonomous Car Industry, Autonomous Car Market Value, Autonomous Cars Market, Autonomous Cars Market Forecast, Autonomous Cars Market Research, Autonomous Cars Market Segmentation, Autonomous Cars Market Share, Autonomous Cars Market Size, Battery Electric Vehicle, Global Autonomous Cars Market, Hybrid Electric Vehicle, Internal Combustion Engine, Level of Autonomy.